I have written this review a couple times because I had a hard time pinning down my feelings. This book had me so introspective that I some times forgot I was reading. Set in 1987, Aristotle Mendoza is an angry guy. He’s 12 years younger than his twin sisters, and he’s got a brother in prison that no one wants to talk about. But that’s just a small part of why he’s angry. And the truth is, Aristotle doesn’t really know why he is angry. He doesn’t get himself. He doesn’t get his family. He’s a little lost. He doesn’t want friends. He wants to be alone. But then he meets Dante. Dante’s a loner too, but he’s lost like a person who at least knows which direction to head. His life perspective is much more open wide. And somehow they develop a deep, true friendship that will carry them through some of the darkest places in adolescence and self-discovery. My initial thought about this book is that it is very Perks of Being a Wallflower-esque in style and how the self-discovery unfolds. This is less about plot and more about Aristotle “Ari”s journey to understand himself as he changes from a boy to a young adult/man. It’s about the importance of family, loyalty, love, and acceptance. 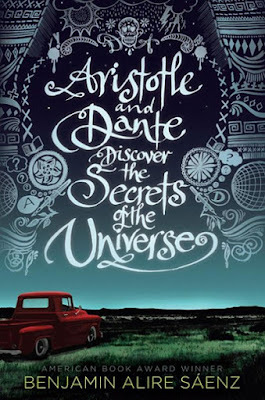 I spent this entire book in deep thought, following Ari and Dante’s friendship. It made me hope that I’m a good, loyal friend. That I can be a good parent or at least make it clear to my kids that we’re all muddling through life, so let’s try and do it together. I think anyone who has struggled with family, or understanding themselves or how they fit in to their surroundings/life will really connect with this book. Even though Ari and I had different struggles at the age of 16, I really related to some of the things he was feeling. This is a super quick read, as some of the pages only contain a paragraph. It’s a great, thoughtful, coming of age book!